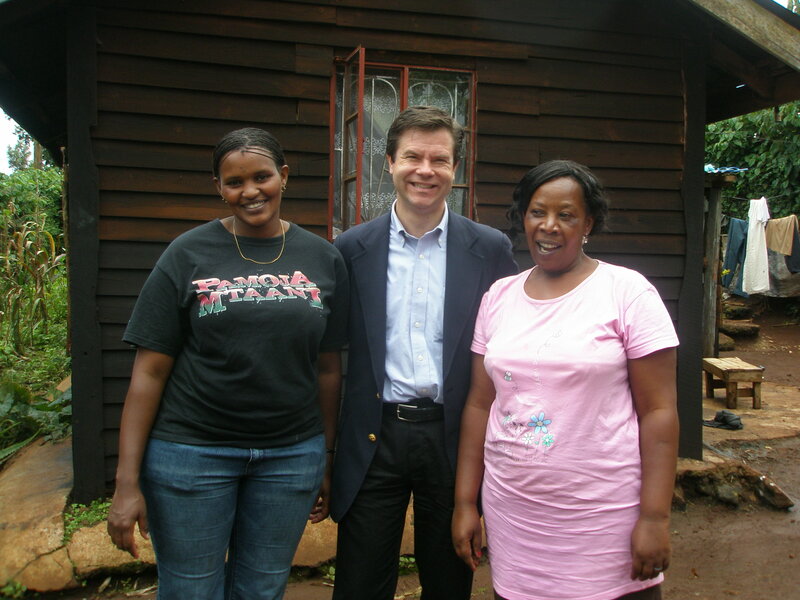 Grameen Foundation’s recent trip to Kenya was a watershed event. Our founding director Professor Muhammad Yunus joined us at our Board meeting, held for the very first time in Africa. In addition, and members of our Board and our staff participated in the Africa-Middle East Regional Microcredit Summit, the largest microfinance convening in Africa’s history. Several of us presented Grameen Foundation’s work to the assembled delegates at some of the event’s sessions. Staff members Camilla Nestor, George Conard, and Julia Assaad (of our joint venture Grameen-Jameel Pan Arab Microfinance) presented to scores of delegates eager to learn from our experts. Most of the presenters, however, were African microfinance leaders including several who are long-standing partners of ours. I was pleased to kick off the third day of the summit by addressing a plenary session moderated by Dr. Helene Gayles, CEO of CARE International. During the session, I spoke about microfinance as a platform for improving the health and well-being of Africa’s poor and poorest families. Although we spent 45 minutes on questions from the attendees, I was still left with a huge pile of unanswered written questions after the session ended! The 800 delegates who attended the session seemed hungry for information on making microfinance a more effective tool for empowerment. The most memorable part of the trip was our visit to Kenya Entrepreneurship Empowerment Foundation (KEEF), a Kenyan microfinance institution that is benefitting from, and helping to further refine, some of our signature initiatives designed to advance microfinance in Africa. They are one of the earliest adopters of our Mifos technology platform that is designed to dramatically increase the efficiency and transparency of microfinance. They are also using the Progress out of Poverty IndexTM, our industry-leading tool that measures poverty reduction outcomes. KEEF is the first MFI globally to pilot our mobile money concept to make the transfer of loan monies and repayments much easier and more secure for clients. It was clear to all of us who participated in the field trip how much KEEF and its clients are benefitting from these programs and the important role our staff, volunteers, and donors are playing in making this powerful alliance possible. This entry was posted on April 21, 2010 at 3:46 pm and is filed under Uncategorized. You can follow any responses to this entry through the RSS 2.0 feed. You can skip to the end and leave a response. Pinging is currently not allowed. It is indeed a very noble and excellent initiative pioneered by Prof.Yunus,country like India where certain areas are still devoid of many development activities due to geography,unavailability of resources and local issues ,Grameen Foundation can show some light in the darkness all around…….If i can be of any help in any way. May God Bless You For Real. With appropriate help from Grammeen foundation,poor in any country can jump out of the vicious circle of poverty only if they are ready to make use of the synergy of social capital of self Help groups.May these type of organisations extend help to the needy always. Hi I am grateful for the work that you do to lift the poor out of poverty. we are working hard for the orphaned poor children to come out of poverty by giving them education for a better future. In doing this we have been finding financial challenges along the way. For this matter I would like to know whether our Non Government organization which is not profit making can benefit from Grameen Foundation’s mission. We operate from Uganda. Please, let me know as soon as possible, how to get in touch with one of the Leader-Instructor on Micro-finance Program of Dr Muhammad YYunus for the Poor Countries. I am very interested. I want to put a similar project in one of the poorest communities and Countries of the Western Hemispheres. Thanks. Yes, I am still interested of receiving more details and information about the use of this powerful tool to get involved in Micro-finance with Dr Yuranus Program. This program will be a powerful powerful incentive for the Reconstruction of Haiti after this Earthquake Crisis, Cholera, and the Tomas Cyclone lately. When I was talking about the Western Hemispheres it was referencing to Haiti in the West Indies not about the Western parts of Africa. We have a Women Association of more than 350 people waiting on this program. They come together on a regular weekly basis to receive instructions with great expectation about this Micro-Finance System. We are involved them in the basic education such as Finance, Business, Entrepreneurship, Management and Economics and Trust Services. Maybe we didn’t give the report, it is about 600 women now P. Deshommes. Please, only today I was able to see this memo. This time I would like to ask you to contact directly as soon as possible Agroname/Pastor Loulouse Macajoux, our Representative for our Women Association and our Group of Farmers in Haiti, W.I. .